Webb says the rookie running back is picking up the offense quickly. Davis Webb knew that Saquon Barkley was special as soon as he saw him eat breakfast. 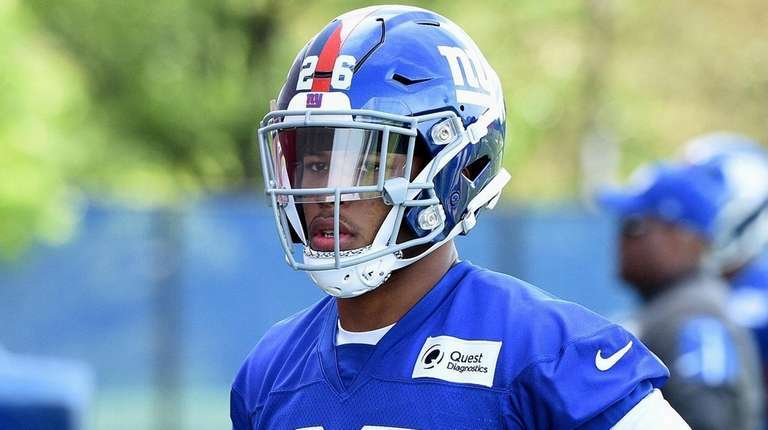 Webb said that Barkley, a running back whom the Giants selected second overall in April’s NFL Draft, picked up the offense quickly in minicamp, something that can be a bit of a struggle for young players. Barkley is another playmaker in an offense that features Odell Beckham Jr, perhaps the most dynamic playmaker in the game. Whether the two will be on the field when training camp begins next month is a lingering question. Beckham, who has not spoken to assembled media since Oct. 4 2017, told reporters earlier this month that he does not intend to hold out. He is entering the final season of his rookie deal and is due to earn about $8.45 million for 2018. Although Webb declined to comment on the contract situation of his teammate, he did speak to how close the two are off the field. Webb added that the public perception of Beckham is completely different from how he is as a teammate.